The DC Breeze will play their home games at the brand new Carlini Field at Catholic University of America for the 2019 season, as the team moves about 200 yards north of Cardinal Stadium where they played last season. Carlini Field is located on Bates Rd NE, Washington, DC at the north edge of the CUA campus. The field is an easy 0.9 mile walk from the Brookland-CUA Metro station (Red Line). See Access and Parking map below. Note that both of these lots have limited spaces, with overflow street parking on John McCormack Rd south of the Taylor Street Bridge. NOTE: Plan to come on the early side if you're driving and prefer to park in the lot next to the stadium, as spaces are limited. Gates open 30 minutes before the game. Also, there may be a line of cars on the right side of John McCormack Rd as you head north toward Bates -- this is a line for the Fort Trotten Transfer Station, and you can drive around the line on the left to make the turn onto Bates. 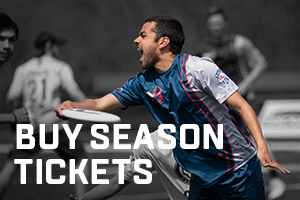 DC Breeze are a professional ultimate frisbee team in the AUDL East Division. Founded in 2013, we represent and play for The District.